So far, so good for the Bridgeport High School girls basketball team. Actually, so far it’s been perfect. The Indians have started the season 3-0 with a road win, a victory on a neutral site and a home-opening triumph as well. Bridgeport toppled Braxton County 54-37, followed that up Saturday with a win at the Fairmont Senior Field House against Class AAA Spring Mills by a 55-50 score, and then a win Tuesday by a 77-21 score over Robert C. Byrd. One constant in the early going has been the outstanding play of Emily Riggs. The senior has been scoring at a blistering pace to help the squad stay unbeaten in the early going. How good has Riggs been? In three games, she’s scored 85 points and already has double digits in 3-point field goals made. On Tuesday against the Eagles, Riggs outscored the opposition in the lopsided win. She scored 30 points to RCB’s 56-point victory. Bridgeport led 21-5 after one period and 37-17 at the half. The game was completely blown open in the final two frames as the Indians limited the Eagles to just two points in the third and fourth quarters. Rory Marple had a big game as well. She finished with 20 points to also nearly outscore the opponent. No other BHS player was in double figures. While that win came easy, Saturday’s victory required a late surge to get past Spring Mills. Riggs led the way with 25 points, but it was Marple that came up big late. The senior, who finished with 14 points, scored five straight points when the game was tied at 46 to give her club the lead for good. “That was good to see because she struggled against Braxton. In fairness, Rory wasn’t healthy in that first game with a strained rotator cuff. 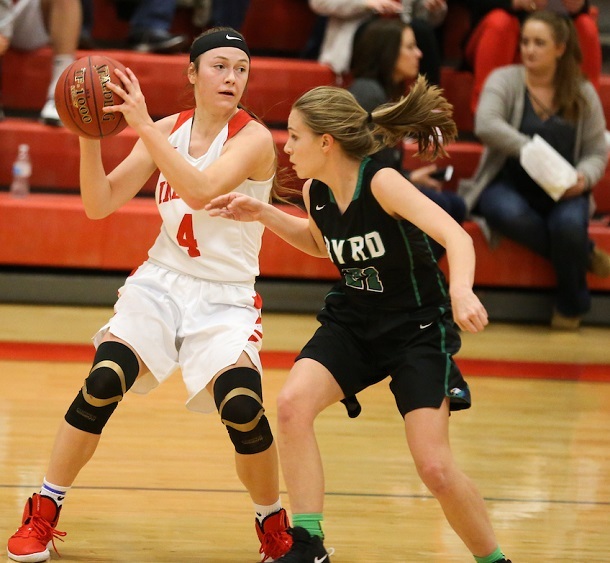 In that second half against Spring Mills she played well and was key when things were tight,” said Hutson. Bridgeport started the season last Thursday on the road. And the road proved kind. The Tribe jumped out to a 17-2 lead and never looked back. Riggs nearly outscored Braxton County as she finished with 30 points, i ncluding 14 in what turned out to be a decisive opening quarter. Paige Humble proved to be the offensive partner for Riggs in this outing. 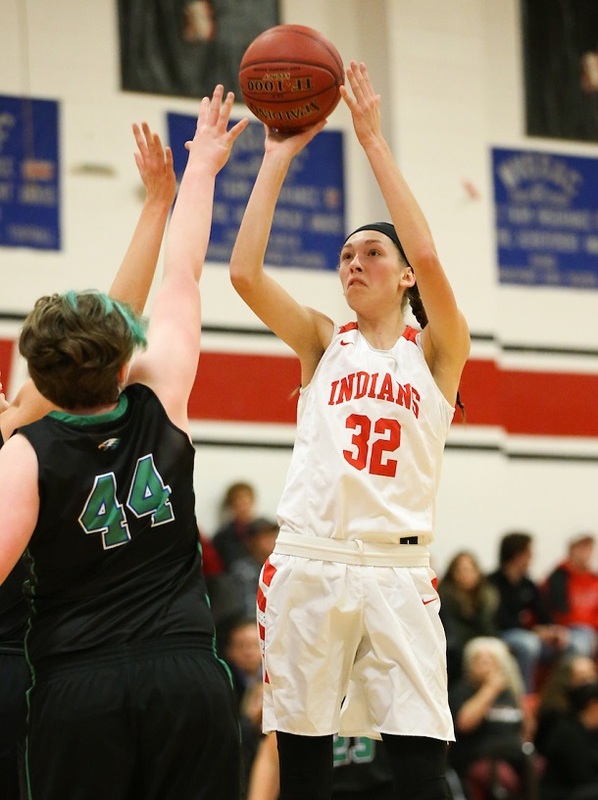 She finished with 12 points on five-of-eight shooting to give the Tribe a bit of balance and the opposition another player to focus their defense on. Things don’t get easier for Bridgeport in the next few days. 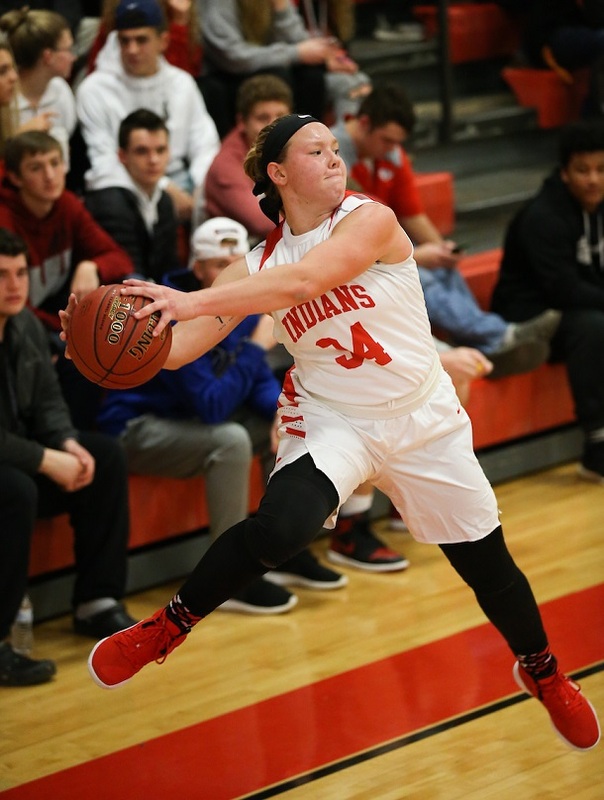 The Indians visit Class AA power Fairmont Senior this evening at 7:30 p.m. and will face Class AAA George Washington next Thursday at the Waco Center on the campus of Glenville state College. That game is also at 7:30 p.m.
Editor's Note: Photos by Joey Signorelli of www.benqueenphotography.com.